The film director Hugo Santiago (Buenos Aires, 1939 – ) made two unique feature films in collaboration with Jorge Luis Borges and Adolfo Bioy-Casares. The first film Invasión / Invasion was made in Argentina in 1969 and second Les Autres / The Others was made in France in 1974. Originally from Argentina, he has been predominantly based in Paris since 1959, where he has made both fictional features and a range of essay films and documentaries on and with figures such as Maurice Blanchot and Iannis Xenakis. 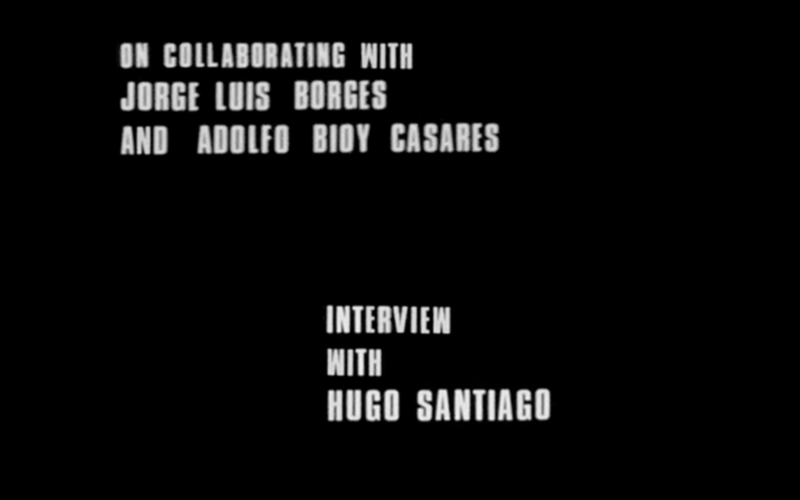 This film features an interview conducted with Hugo Santiago in Paris, September 2008 focused on his work with Borges and Bioy-Casares on these two feature films; the development and planning of Invasion and in particular the design and mapping of the fictional city of Aquilea out of fragments of Buenos Aires. The discussion of his second and lesser known film Les Autres explores the films complex splintered narrative, his use of colour as well as the films troubled premier at Cannes in 1974. The interview was conducted in French with live translation by Aubrey Richard Wanliss-Orlebar. Thanks to Chris Pencakowski for technical assistance.